I did something I haven’t done in a while…I cooked! I was itching to get back into the kitchen for some simple, whole food. When I got home from work I scoured our pantry and refrigerator to see what I had to work with and ended up basing my meal on brown rice and chick peas. I also pulled out some veggies that we had on hand to round out the dish. First I sauteed about 1/3 of an onion and got the brown rice in a pot to cook. 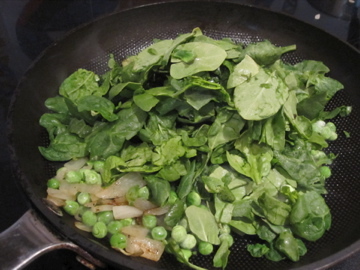 When the onion was soft, I added 1 cup of frozen peas and 2 huge handfuls of torn spinach. 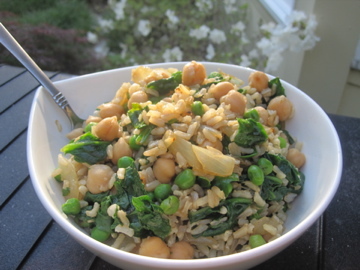 To help the spinach wilt down, I poured the cooked brown rice into the pan along with 1 cup of drained and rinsed chickpeas. After about one minute I poured the mixture into a bowl and popped it into the fridge to cool for a few minutes. I just wasn’t in the mood for a piping hot meal tonight. I cleaned up my mess and when I was finished I pulled the pot out of the fridge to serve. The mixture got sprayed with a hefty dose of Bragg’s Liquid Aminos before I took it outside to photograph. GENIUS! The tahini totally made this dish. It added the most creamy, lucious texture and blended perfectly with the other flavors. I immediately got out a little jar and packed up some tahini to take to work for tomorrow’s leftovers at lunch. Before this meal might have just been a quick throw together supper, but now it’s a recipe I can’t wait to recreate! Prepare brown rice according to directions. 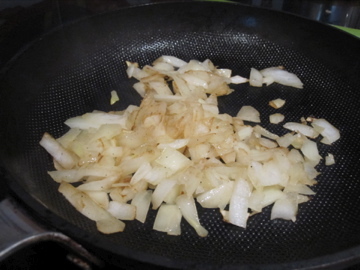 While rice is cooking, sautee onion in a pan on medium heat. When onion is translucent, add peas and spinach. 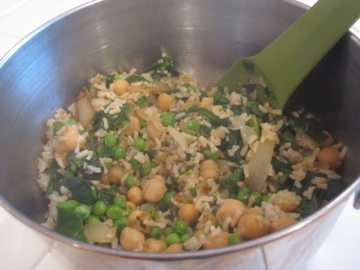 Pour cooked rice overtop the vegetable mixture to wilt spinach and add chickpeas at the end. Pour mixture into a bowl and add Bragg’s Liquid Aminos. Drizzle tahini on top and serve! I love it when random thrown together meals end up being killer! 🙂 Sounds yummy! tahini makes a great quick sauce, but i always find i need some tomatoes to balance out the dryness of it. yummy looking meal. straight up my alley. I’ve never had tahini in anything but hummus. But I have a sample jar (thanks to your post on the way to get the small samples!) I’ve been wondering what to do with it, now I know! wow what a perfect mixture..would have never thought to add tahini but it sounds amazing! I’ve been loving brown rice lately. Usually I eat it with soy sauce, garlic, and runny eggs. I’d love to give this a try though. I have yet to try tahini! Ooh this looks SO good!! Mmmmmmmmmmmmmmmmmmmmmmmmmmmmmm You make this meatless food look good! I’ve not had tahini! My parents eat it on toast…which, compared to peanut or almond butter, doesn’t seem very tempting. But it sounds great atop your savory dish! I have some similar recipes you might like to try over at lizashlee.com. Check it out when you get a chance and let me know what you think. Even though I have been reading food & fitness blogs for awhile, I just started my own, and I am SUPER excited!! I’m always looking for more ways to use tahini–this is a great idea!